DESCRIPTION: Part of the ‘Despatches From The Front’ Series, this presents a fine collection of highly detailed reports as primary source material. The war in the Far East has often been called the Forgotten War but the campaigns in East Africa received even less attention. This book will be welcomed by historians and enthusiasts but its affordable price makes it available to a wider readership. Most recommended. The authors have presented a selection of reports that provide clear insights into a series of campaigns that were fought with determination and bravery by British and Colonial troops, including native militia, with old equipment against an enemy that should have done better than it did. It was one example of the inability of Britain to fight German and Italian troops in every theatre at the same time and with professional soldiers and modern equipment. The campaigns in Africa that received most coverage at the time and subsequently by historians were the North African campaigns where Axis and Allied forces chased each other back and forth along the North African coast. Of course these campaigns involved large numbers of troops and provided some dramatic British advances at a time when British troops were being forced back everywhere else. The fact that the Suez Canal was potentially at risk was another reason to focus on the North African Campaigns, but the East African Campaigns faced an equally deadly threat and quietly fought on to victory. As other priorities had denuded British East African interests of troops and pilots, the Italians had a great opportunity and a relatively lavish issue of men and equipment with a good set of supply dumps. In theory they should have been able to have swept the British and Commonwealth forces down towards the Cape. They could have closed the Suez Canal and established ports for the German U-Boats and surface raiders that were already operating in the Indian Ocean, Had they swept on down through Kenya, it would have been a blow to Allied morale and a serious loss of raw materials. Had there been real co-operation between Germany and Italy, the East African campaigns could have timed with the North African campaigns to achieve early victory and cut communications between Britain and its Indian and ANZAC resources. So much to play for but Italian ego got in the way and the Axis forces already had a full set of commitments in the Mediterranean, which had stronger German focus. 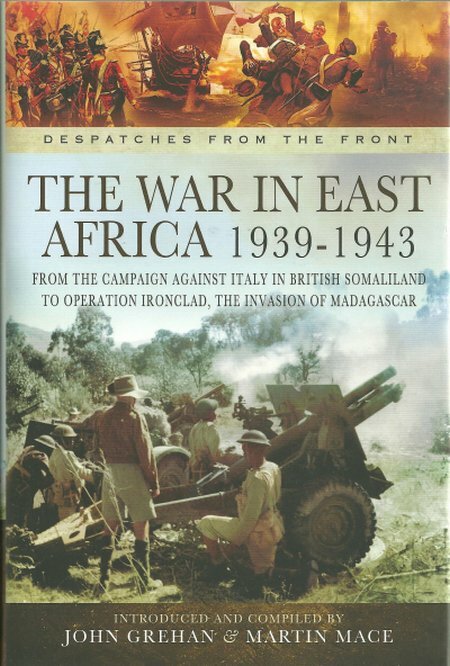 If East Africa did not feature strongly in the British war focus, it lacked nothing in the courage of the available forces as they stoutly defended against Italian expansion and then took the fight to the Italians. Determination and ingenuity made up for a lack of modern equipment . Through the campaigns, WWI QF guns and rifles were common. The local militia, raised in Kenya, as part of the para-military police resources available to District Commissioners, formed part of the Allied forces and Camel Corps troops added to the WWI flavour of actions, accompanied by a handful of Rolls Royce armoured cars that last saw action with Lawrence of Arabia. Not only were the Allies fighting the Italians but they also had to counter Vichy French forces in Madagascar. The reports provide a balanced view of how the senior Allied commanders saw the campaigns and are all the more fascinating because they cover one of the most under-reported theatres of WWII. The text is supported by illustration with a very good photo plate section that contains rare photographs. The material also shows one of the great dangers of not winning for Britain and its Allies. Germany and Italy may have had their frictions and poor co-ordination, but the Japanese element of the Axis was effectively cut off from the War in Europe. Had the Vichy French still controlled the naval bases in Madagascar and been able to work with the Italians to take East Africa, with its naval bases, Japan would have been able to move its powerful navy West and link up with the German Navy. That would have completely cut Britain off from the Middle East, India, Australia, and New Zealand, preventing British reinforcement of those vital areas and preventing the flow of India and ANZAC troops to support Allied actions in North Africa and Europe. It would have also denied Britain access to its main sources of oil and other vital raw materials. It would not be over-stating the effects of the gallant actions of British and Commonwealth troops in East Africa to say that they denied the Axis a pivot point that could have decisively turned WWII in the favour of the Axis.